Californians who are struggling to stay in their homes and avoid foreclosure are about to get a leg up. State Attorney General Kamala D. Harris on Thursday announced a settlement with banks over abusive foreclosure practices. The agreement could funnel as much as $18 billion to hard-hit homeowners. California secured the money as part of a larger $25 billion multistate settlement to penalize robo-signing and other bank servicing and foreclosure misconduct. California pulled away from an earlier proposal that would have netted the state only $4 billion. Bank of America, JPMorgan Chase, Wells Fargo, Citigroup and Ally Financial will reduce loans for nearly 1 million households across the country. Checks for $2,000 will be sent to about 750,000 Americans who were improperly foreclosed upon. Read more in Kevin Smith’s story BANKS. Roll the dice and gamble on love at the Walnut Senior Center Valentine’s Day dinner dance on Friday, Feb. 10, from 6 to 9 p.m.
Luck will be your lady as you enjoy an evening of live entertainment, a buffet dinner, games and prizes. The cost is $12 per person, $10 for members of the senior club. The center is at at 21215 La Puente Road in Walnut. For more information, call 909-598-6200. 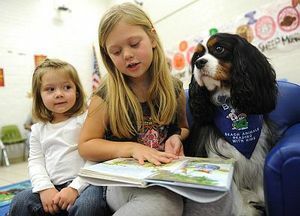 The new reading program at Diamond Bar Library is all bark and no bite. Actually, there isn’t a lot of barking either. But Barks and Books has enthralled the young readers who line up on Saturdays to read their favorite books to some new canine buddies. “We offered it on Monday nights in the fall, but moved it to Saturdays this year to make it easier for families,” explained Julie McCasland. Read more in Rich Irwin’s story BARKS. In part of the effort to clear up logjams along Valley Boulevard, Industry has plans to embark on a $4.1 million, 2.3-mile endeavour to widen Valley Boulevard between Azusa and Lemon avenues. The project’s primary goal is to add a third lane to eastbound Valley Boulevard. It also includes adding bus stops, right-turn pockets, improved stop lights, storm drain outlets and even installing a small boulder-lined drainage stream. For years, Valley was a four-lane street. The city recently restriped westbound to increase the number of traffic lanes from two to three. “That really cleared up traffic there quite a bit,” said John Ballas, Industry’s engineer. But there’s not enough room on the south side of the street to make three lanes, he said. About 50,000 cars daily use the stretch of road. Roll the dice and gamble on love at the Walnut Senior Center Valentine’s Day dinner dance on Friday, Feb. 10, from 6 to 9 p.m. Luck will be your lady as you enjoy an evening of live entertainment, a buffet dinner, games and prizes. 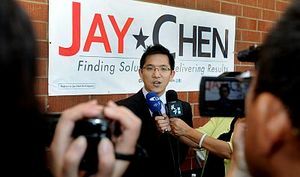 Hacienda La Puente Unified school board member Jay Chen came to Wilson High School on Thursday and announced his run for Congress in the redrawn 39th District before about 50 enthusiastic supporters. The 33-year-old native of Hacienda Heights and owner of a real estate investment firm, billed himself as a moderate Democrat whose outside-the-beltway status would breathe new life into a polarized, do-nothing Congress. “The incumbents in Washington, D.C. – they simply don’t get it. They are fighting amongst each other to prevent progress. They are too busy protecting their own jobs to create jobs for the rest of us,” he said from the stage of the band room at his alma mater. Chen was referring to his opponent, conservative Republican incumbent Ed Royce, who has spent two decades in Congress and has amassed a $3 million war chest for re-election, according to campaign reports filed with the Federal Election Commission. Read more in Steve Scauzillo’s story CHEN. Walnut True Value Hardware is closing its doors after 14 years in the city of Walnut. Owner, Stuart Tielens said that the current economic conditions prevailing in the country, and here in California in particular, are factors. He also said that there are other factors specific to his business, such as the recently opened Home Depot in nearby West Covina that make it harder to survive. He also expressed some other issues that also contribute to closing the business. able to contributed to, have made things very memorable. Propane cylinder exchanges and window screening, will be 30% off.